The first documentation of Chief Madockawando was in 1669 when he was described as Chief of the Pentagoets (Penobscots). He was said to be living at Bagaduce near modern day Castine, Maine, which is on the eastern shore of the Penobscot Bay near the mouth of the Penobscot River. Madockawando married a Chief’s daughter from the Kennebec River Valley. This marriage produced many children, most wholly unknown to history except for his daughter Pidianiske. This daughter, later baptized as Marie Mathilde, married a French Nobleman, Jean Vincent d’ Abbadie, the Baron of St. Castin. The Baron was sent to Maine in 1670 and moved from Fort Pentagoet to the local Indian village. Madockawando and the Baron became friends and engaged in trade relations. This relationship, as well as the marriage, helped solidify the alliance between the French and Penobscot in the region. 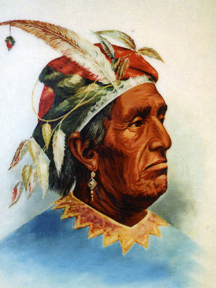 During the time of King Philip’s War, Chief Madockawando sought peace between the Penobscot and the English and attended many peace meetings with Lt. Governor William Phips of the Commonwealth of Massachusetts. Phips drafted a treaty that called for the Penobscot to live under English rule and to cut all alliances with the French, but Madockawando and other Penobscot leaders could not agree to these terms. Chief Madockawando tried hard to stay out of King Philip's War, but after the death of his sister due to English attacks on Fort Pentagoet, he and other Penobscots joined the conflict. On January 25, 1692 Chief Madockawando led 150 Penobscot warriors in an attack on village of York, Maine.